The final day of the month saw the sun come out and the wind drop in the morning, only to increase from the south again in the afternoon with some heavy showers. A 1st summer Little Gull at Westness was easily the best of the new arrivals, while the 9 Black-tailed Godwits seen were presumably some of yesterdays birds. There were 9 Lapland Buntings in the crop fields at Kirbest, a Peregrine flew up the west coast and a new Sparrowhawk was trapped and ringed at Holland House in the evening. A bit of activity among some of the Wader species today, most notably a flock of 21 Black-tailed Godwits in fields near Ancum. 345 Turnstones were also counted and among them were 3 Knot and 7 Dunlins. The first Arctic Skua on the beach at Nouster in the evening was long overdue, while passerine interest was limited to a new Dunnock trapped and ringed at Holland House and 28 Redwings-a few of which have started singing! A record shot of some of todays Black-tailed Godwits. It remains very quiet for migrants with a strong westerly wind throughout and frequent heavy showers. A new Sparrowhawk was the only notable arrival of 27th, although there were still at least 5 Lapland Buntings at Kirbest. Another 3 were found in other parts of the Island on 28th when there were also 4 White Wagtails, a Collared Dove and 6 Whimbrels logged. The 25th was another wet and windy day, with most of the days notable sightings coming from the north end of the Island. A couple of Iceland Gulls (juvenile and 2nd winter) were together at Bewan, while an hours sea-watch saw 3 Arctic Terns, 57 Puffins and 290 Kittiwakes pass by. Some 25 Rooks were seen-almost all of them arriving from the north before leaving for mainland Orkney to the south. 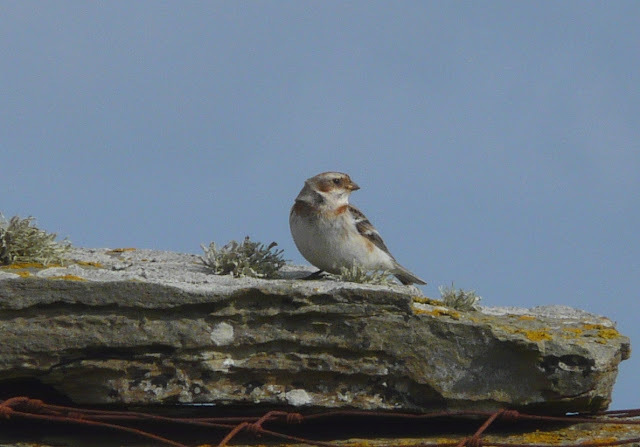 The Kirbest crop field held 8 Lapland Buntings including a few smart summer plumage males and 8 Snow Buntings were on the coast near the Observatory. A Merlin was trapped and ringed at Holland House in the evening (the first to have been done so for 2 years) and there was also a female Sparrowhawk, 2 Black-tailed Godwits and 4 each of Sand Martin and Swallow seen. The 26th was a quieter, but calmer day. At least 6 Lapland Buntings were still at Kirbest and a Brambling was new at the Observatory. 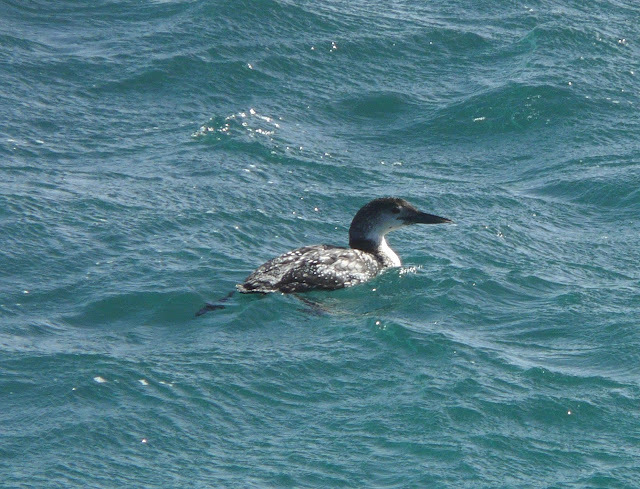 19 Great Northern Divers were counted offshore and the 4 Pink-footed Geese near Hooking included at least 1 new bird. With the strong south-westerly wind persisting, spring migration continues at a snails pace with just occasional new arrivals. On 23rd these included another early Arctic Tern and a Short Eared Owl, and on 24th the first Willow Warbler (almost 2 weeks later than usual) was near Howar. A Goldfinch was also new, as was a Collared Dove while the 2 Tree Pipits seen that day were thought likely to be lingering birds. A strong westerly wind blew all day and a very wet morning saw census moved to the afternoon. Many of yesterdays birds had either moved on or were sheltering out of sight, but a couple of new arrivals were logged today including one each of Long-eared and Short-eared Owls-the latter the first of the year. There were also 7 Whimbrels (6 of which were together) seen, 5 Chifchaffs, 7 Snow Buntings and a Lapland Bunting. A light southerly wind made for an enjoyable days birding with plenty of new arrivals and several species making their first appearance of the year. 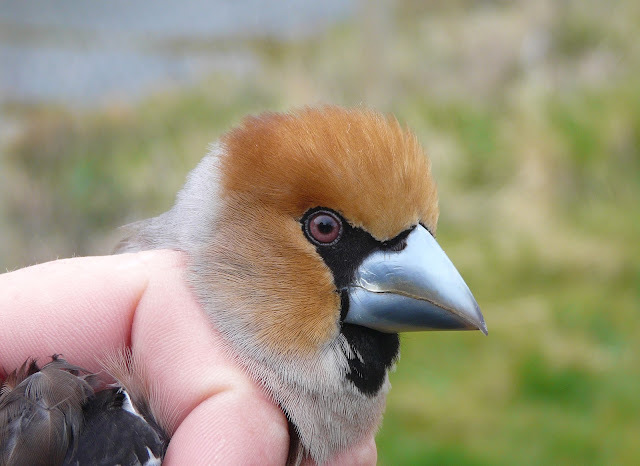 A cracking Hawfinch caught and ringed at Holland House in the morning was the highlight, with the other additions being a Redstart (equal earliest record), 4 Sand Martins, a Greenfinch and a Goldfinch. Further passerine sightings included 2 Tree Pipits, a good arrival of 110 Wheatears, 46 Redwingsand 4 each of Chiffchaff and Goldcrest. 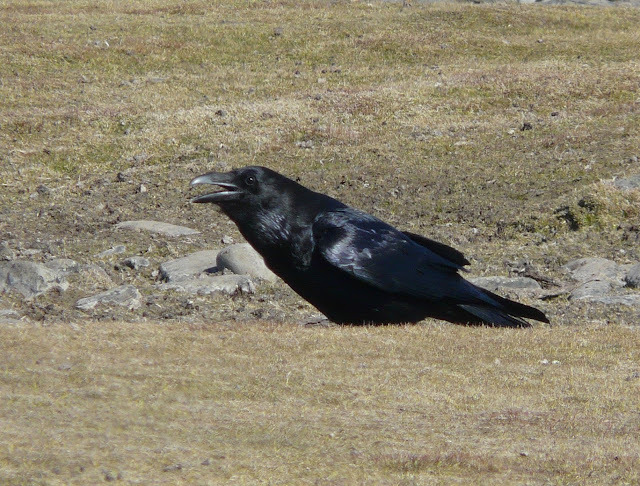 There was some 'corvid' passage too, most notably 7 Ravens which flew south together, while 4 Jackdaws and a Carrion Crow were also new. New arrivals on the 19th were the first Green Sandpiper of the year on the scrape at Kirbest, a Long Eared Owl at Newbiggin and 2 Lapland Buntings. The Tree Sparrow was seen again and a few more Skylarks seem to have arrived with 75 counted. On 20th a Whimbrel and a House Martin were both new for the year and only the second Iceland Gull of 2013 flew past the Observatory in the evening, 4 Black-tailed Godwits were also seen as were 6 Swallows, a Tree Pipit and a few each of Goldcrest and Chiffchaff. Just 'odds and sods' today in a strengthening north-westerly wind. A Tree Sparrow dropped in at the observatory briefly, a new Blackcap and Ring Ouzel were near Ancum, 4 Siskins at Holland House and 30 Snow Buntings on the coast at Gretchen. There were now 3 Black-tailed Godwits on the loch there-where the water level has finally risen to be much more attractive to Waders and 4 Sandwich Terns were also there. 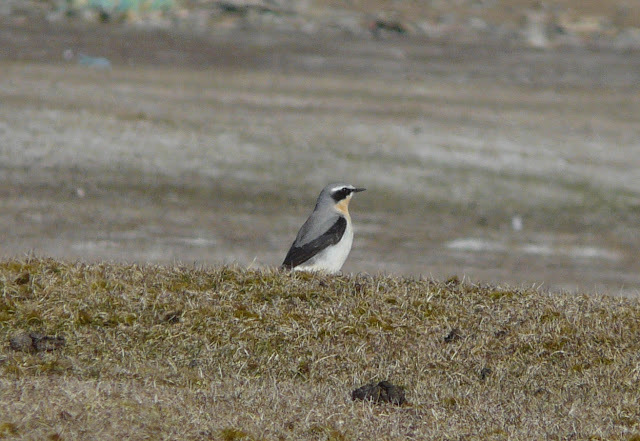 A drop in the wind in the morning saw plenty of Wheatears arrive with 47 counted along the coasts. The wind increased from the south-east after lunch and heavy rain set in but other than 2 Bramblings, a Jackdaw and 10 Rooks, the numbers of other passerine species remained much the same as in recent days. A Black-tailed Godwit was seen and a Greenshank arrived in off the sea at the north end-the later the first of 2013. The first Arctic Tern was off Neven-another exceptionally early record and the earliest on North Ronaldsay by some 3 days. There were also 3 Merlins today and 7 Great Northern Divers off the coasts were nearly all now in their stunning summer-plumage. Another blustery day, with a strong south-easterly wind in the morning switching to the south-west by the afternoon and with it some rain. More new birds appeared, the highlight of which was our earliest ever Dotterel (by almost 2 weeks!!) in the fields between Gretchen and Holland House. 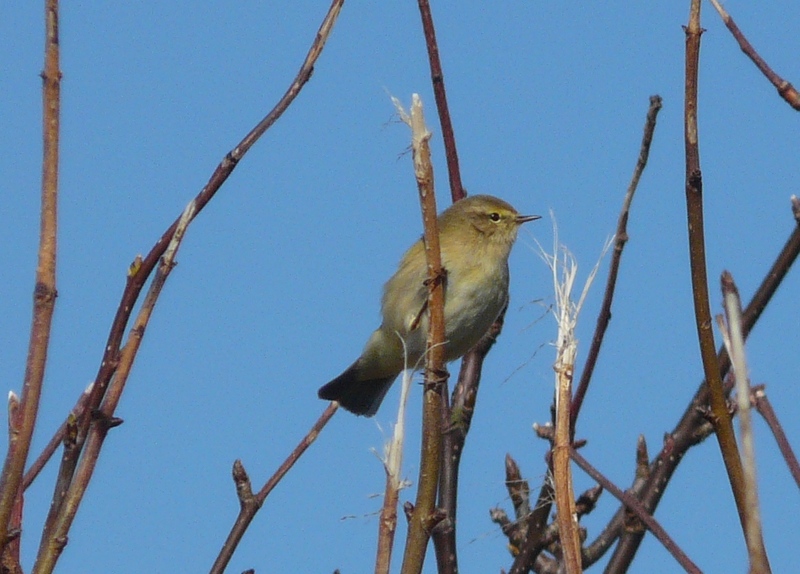 Other 'firsts' for the year were a Blackcap near Westness, and a Brambling and Tree Pipit-both at the Observatory. Other migrants of note were 2 Swallows, a White Wagtail, 16 Wheatears, a Ring Ouzel, 5 Goldcrests, 2 new Chiffchaffs, a Siskin and a flock of 38 Snow Buntings on the Links. The Golden Plover flock increased slightly once again to 446 and there are now 3 Woodpigeons present. A strong southerly wind blew all day, but it remained dry and there were a few new arrivals. These included the first Swallow of the year, 16 Wheatears, a Black Redstart, a new Chiffchaff and a Goldcrest. 3 Sparrowhawks were around Holland House in the evening where 3 Tree Sparrows dropped in late in the afternoon. 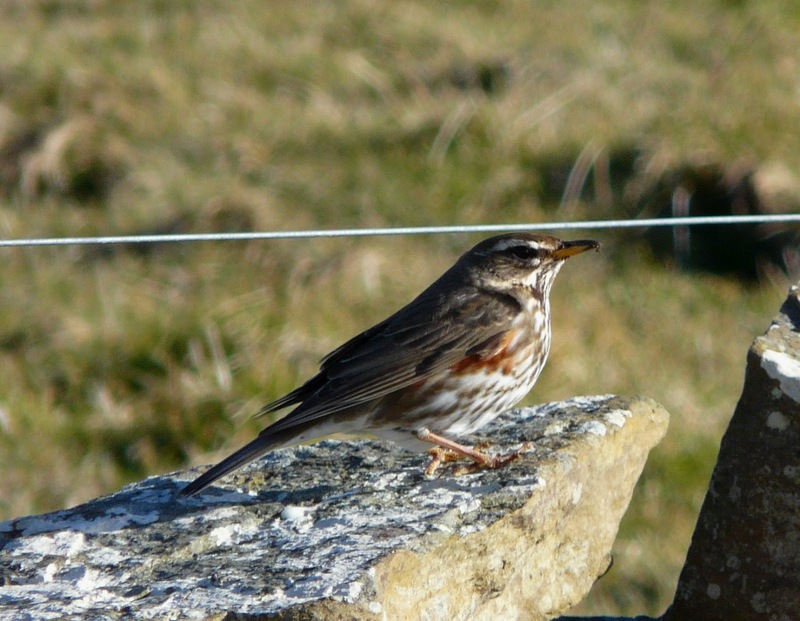 A feature of the day was the continuous south-bound passage of Meadow Pipits with many of the 202 counted heading past the observatory and out to sea in the direction of the Orkney mainland. Numbers of Gulls and Waders on the coasts remain high, while the Golden Plover flock has more than doubled to 420 birds. 2 Sandwich Terns were also seen as were 2 Collared Doves. 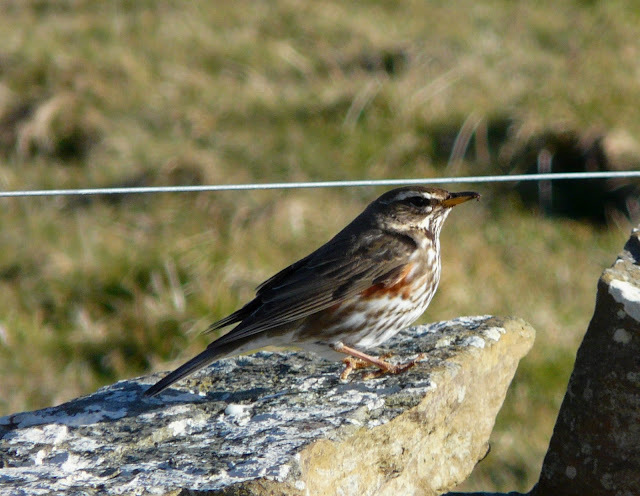 A number of Redwings and Fieldfares have arrived in recent days-a few weeks later than usual this year. 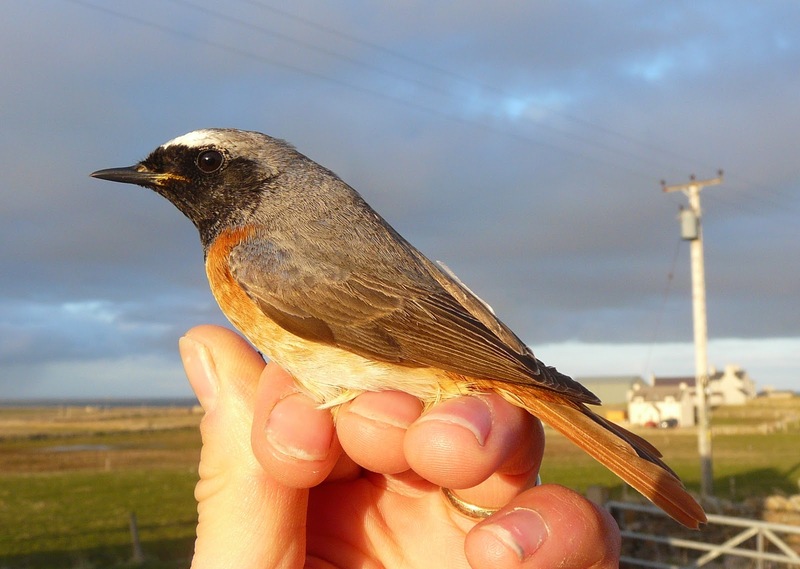 Like many migrant species they have presumably been held up by the snow further south. A wet and windy morning with a prolonged spell of rain at lunchtime before clearing up for the afternoon produced a good and varied arrival of birds; there was however still a distinctly wintry feel in the composition with Thrushes - 76 Blackbirds, 36 Fieldfares, 157 Redwings, 8 Song Thrushes and 6 Mistle Thrushes, 6 Woodcocks and 18 Snow Buntings prominent. Other migrants included 2 Sparrowhawks, a Merlin, the first Ring Ouzel of the year, 218 Meadow Pipits, a Wheatear, 3 Chiffchaffs, 14 Dunnocks, 22 Robins and a Collared Dove. With increased coverage of the island today some high counts of waders and gulls were achieved - especially on the east coast feeding at high tide which included 188 Golden Plover, 326 Purple Sandpiper, 897 Turnstone, 527 Black-headed Gulls, 451 Common Gulls and 202 Great Black-backed Gulls. A fine morning with the wind gradually increasing through the afternoon hinting at the rough weather which hit overnight; there was again a scattering of migrants dotted around which included 21 Robins, 14 Dunnocks, a Sparrowhawk, a Wheatear, the first two Chiffchaffs of the year, 4 Song Thrushes, 3 Mistle Thrushes, 12 Chaffinches, 3 Snow Buntings and the first Carrion Crow of the year. Three Great Skuas were also seen while there was some visible migration seen in the fine conditions with 33 Curlew seen heading high north and a few passerines seen out over the sea including a Dunnock picked out heading across the sea - a strange sight which contrasts strongly with the Dunnocks you see hopping around in your garden! The brisk wind and showers died away to produce a lovely, sunny day with a good scattering of migrants across the island; our totals (counted in between rounding up sheep!) comprised 24 Robins - including a Norwegian ringed bird trapped at Holland House, 8 Dunnocks, 26 Pied Wagtails, a fine adult male Sparrowhawk also caught at Holland House in the evening, 129 Meadow Pipits (easily the highest count of the year so far), two Wheatears, a Mistle Thrush, 12 Chaffinches, a Siskin, 14 Rooks and two Snow Buntings. 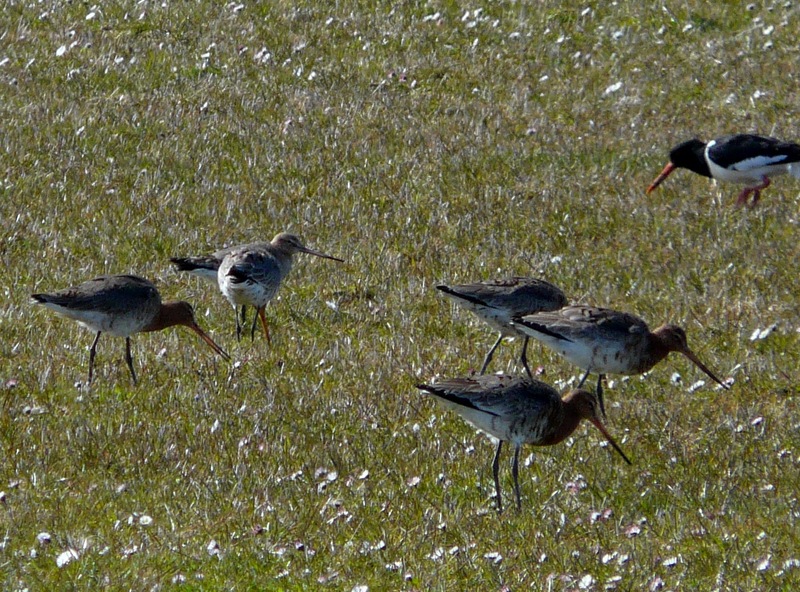 Other notable counts included 113 Golden Plover, 286 Sanderling and 13 Red-breasted Mergansers. Cold easterlies continue to blow but there was little to show for it today; migrants included another Sparrowhawk, one or possibly two ringtail Hen Harriers, two Bonxies, two Sandwich Terns roosting on Gretchen Loch to escape the biting wind, a Mistle Thrush, 70 Meadow Pipits - a new high count for the year, 13 Pied Wagtails and another two new Robins. A return to brisk, cold easterlies brought a few birds into the island on the 9th including a female Sparrowhawk, a Dunnock, another Wheatear, two Rooks, four Snow Buntings and two Reed Buntings while the Lapland Bunting was still in the Kirbest area. A few sharp showers through the day on the 10th helped bring some more variety into the quality of migrants with a Black Redstart at Neven, two more Wheatears, three new Robins, 50 Meadow Pipits with small groups dotted along the coast, a Sandwich Tern off The Links and the first Great Skua of the year flying low over the West Banks - one of the returning breeding birds or just a migrant? Other counts through the day included 145 Sanderling, 130 Purple Sandpiper, 255 Turnstone, 175 Black-headed Gulls and 167 Common Gulls mainly feeding on the exposed east coast where the high tide churned up the seaweed on the beach. 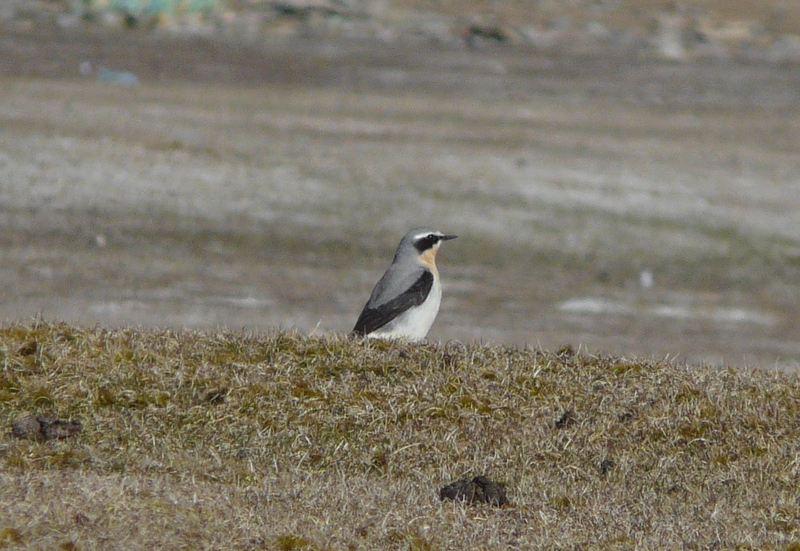 Headline birds today consisted of the first two real 'summer' migrants on the isle with a fine male Wheatear on The Links and three Sandwich Terns in Nouster Bay - two weeks later than last year for the Wheatear and three weeks for the Sandwich Tern, this years prolonged winter weather has certainly had an effect! Other migrants today included a 1st winter Hen Harrier, three Snow Buntings, yesterday's Lapland Bunting still with the Skylarks in Kirbest and a juvenile Glaucous Gull which flew up the island with other Gulls. Wader numbers have also started to rise over the last few days with counts today including 63 Ringed Plover, 87 Golden Plover, 122 Sanderling and 108 Purple Sandpipers. Four Herons and a Rook were the only birds of note on the 6th which saw a return to very cold northwesterly winds with snow showers. It was a much nicer day on the 7th, although still pretty chilly and a few more birds were seen as a result. A seawatch from the north end in the morning saw 235 Kittiwakes, 27 Gannets and 7 Puffins in amongst small numbers of Guillemots and Razorbills while land birds included a Lapland Bunting which joined an increased 150 Skylarks in Kirbest, with small flocks also heading off north through the day. Also seen were 33 Meadow Pipits and 4 Rooks while other notable counts from census included 85 Golden Plovers, 224 Turnstones and 19 Great-northern Divers. 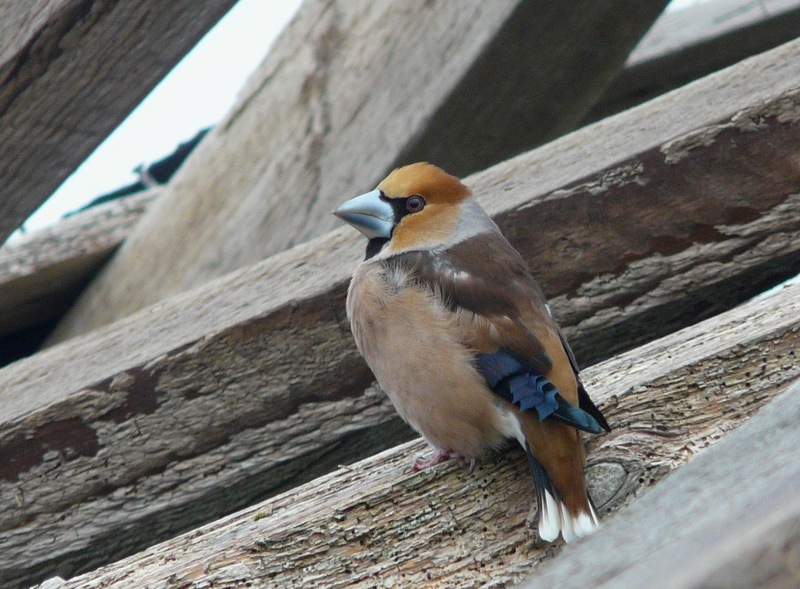 Our latest bird report, the 2012 edition is now available to order! Click the image on the right hand side for details on how to get your hands on a copy now. Or, you could join the Friends of NRBO to receive additional newsletters and discounts on accommodation when visiting the Observatory, just follow the link from the homepage. For existing 'Friends' now is the time to renew your membership to ensure you don't miss out on our very latest production. A slight change in the weather with the wind switching to the SW and cloud building from the afternoon to produce some showers later on seemed to shake things up a bit resulting in a nice variety of species seen through the day. The highlight - in island terms was a Common Buzzard, first seen over Sangar then shortly afterwards seen heading south over the Observatory towards Sanday with angry Common Gulls making sure it actually did leave! Other birds included a Black Redstart at Garso, a group of 4 Siskins, a Long-eared Owl which was trapped at Holland House and the first Puffin of the year off the west coast along with counts of 21 Red-throated and 19 Great-northern Diver while four Harbour Porpoise were seen during the morning while the seas were still very calm. The continuing calm seas over the last couple of days have produced peak counts of 21 Red-throated Divers, 18 Great-northern Divers and 440 Black Guillemots while the first littoralis Rock Pipit of the year was noted on the 2nd. The 3rd saw a bit more variety of the land with a minimum of 9 Rooks milling around the island, a Collared Dove, 9 Pied Wagtails and an influx of Twite with c70 seen around the Obs - some of which were ringed birds from elsewhere in Orkney. Also noted on the 3rd was a small passage of Kittiwakes and Gannets moving between us and Sanday while Snipe have just started to add to the spring atmosphere by enthusiastically drumming overhead and giving their distinctive 'creaky gate' calls. This Curlew was certainly a surprise catch in the mist-nets at Holland House! Wall to wall sunshine and light winds through the day produced some evidence that birds are starting to move. The first Sparrowhawk of the spring seen at the lighthouse plus increased counts of 21 Meadow Pipits and 8 Pied Wagtails. There was some light Corvid passage with 6 Rooks, a Jackdaw, 15 Hooded Crows which certainly involved some migrants and a single migrant Raven heading south extremely high up. The days highlight however, were two stunning breeding plumaged Slavonian Grebes which spent the day in Nouster Bay, with the bird originally seen a few days ago also still present in Linklet Bay. Other birds on the sea included 17 Red-throated and 6 Great-northern Divers, while a ringtail Hen Harrier and a Merlin caused repeated panic amongst the feeding waders and Starlings. The sun continued to shine, but the month ended quietly on the bird front with just a few 'scraps' worth mentioning. A Woodcock at Holland House was the first for a while, with a new Robin also there and a Dunnock was at Lurand. 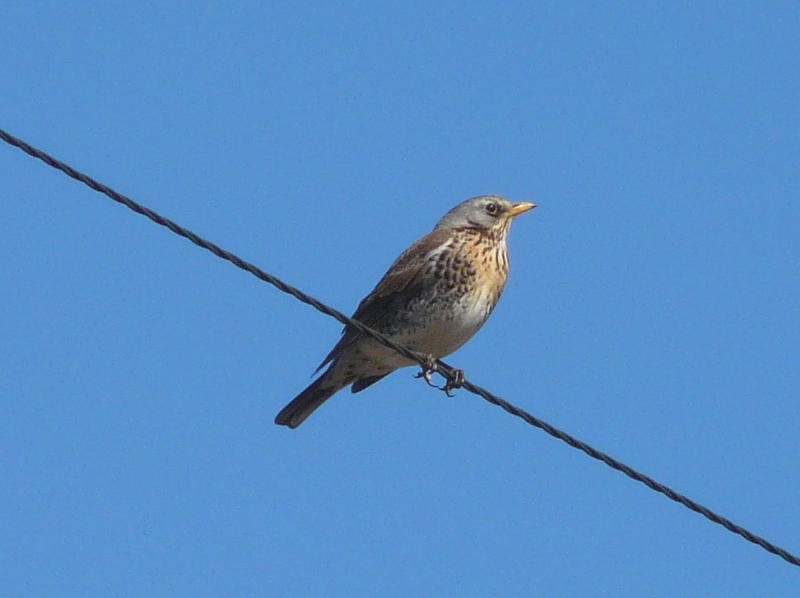 Meadow Pipits struggled into double figures for the first time with 11 counted and the Ancum Stonechat was seen again.